Artist Lynda Abraham’s fascination with human behavior drives her to invent contraptions that alter human behavior – creations that twist and turn bodies and minds, challenging the artist physically and her audiences mentally. On Friday, May 18 in legation, a gallery, she will provoke Cleveland’s collective conscience with her work Having No Alternative / Gone Too Far during the 78th Street Studios building-wide THIRD FRIDAY art walk. Abraham’s piece – one part sculpture, one part performance art – explores electrical indulgence and its effect on the consumer. 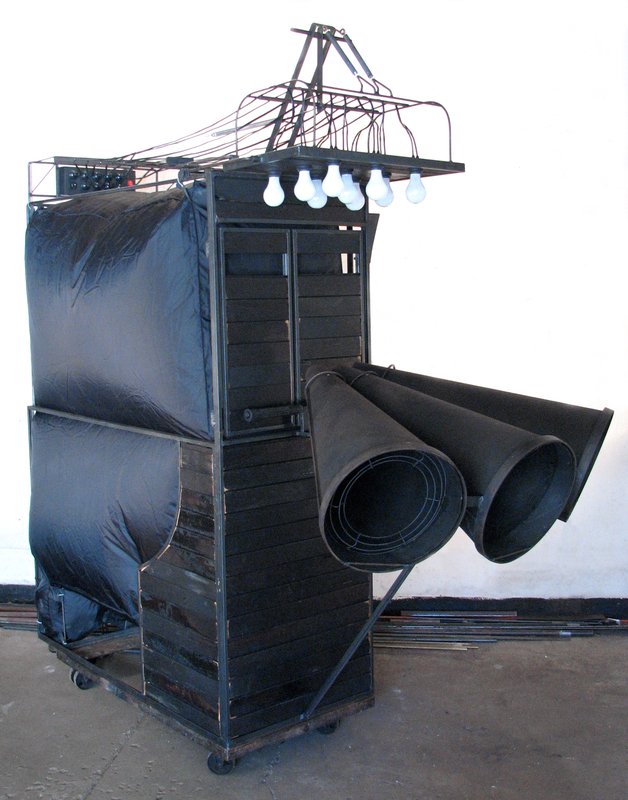 As a literal part of the work, the artist propels her contraption, which inflates, creates sound and lights up as it devours electricity and, with distance, completely shuts down as the power cord yanks from the wall. The accompanying audio spews commentary from alternative energy naysayers in the public eye (Sarah Palin, Glenn Beck, Rush Limbaugh, Rudolph Giuliani and others). Symbolic of America’s over-inflated sense and sensibility of “power, Abraham’s piece highlights the dark side of our reliance on electricity, commenting on excessive use of current and the consequences of sudden departure. THIRD FRIDAY goers can meet Abraham and experience Having No Alternative / Gone Too Far inside legation, a gallery from 5-10p. Ardent Cleveland IngenuityFest followers may recall the premiere of the piece during last fall’s 2011 festival. Abraham, a resident of Queens and creator of Williamsburg, Brooklyn’s Hope Street artist community, has been on the Cleveland art scene for a year. She is one of three artists past and future to participate in a residency designed and supported by local experience artist Melissa Daubert, an IngenuityFest board member intent on cultivating talent for Cleveland’s celebrated annual art + technology event. New York-based artist Lynda Abraham combines video, installation and performance to create scenarios for the contemplation of complicated relationships. Many of these works engage the viewer’s body to intensely dramatize these connections. Abraham’s projects allude to the interpersonal fallout that results from the “advances” of a technologically-evolved culture, while recalling the conventions of early, sketchy social science experiments and turn-of-the-Twentieth-century kinetic novelties. Abraham received her M.F.A. from Pratt Institute, Brooklyn NY and has been awarded residencies at Skowhegan School of Painting and Sculpture, Skowhegan NY; Sculpture Space, Utica NY; and Vermont Studio Center, Johnson VT. She had the opportunity to participate in the Artist in the Marketplace (AIM) Program. Her work has been exhibited at venues including The Bronx Museum; Exit Art, NYC; Dam Stuhltrager, Brooklyn NY; and the International Contemporary Art Fair, Brussels, Belgium. She was a resident of Williamsburg, Brooklyn for 10 years and created an artist community and studios on Hope Street. She now resides and creates work in Queens, New York. legation, a gallery is a bastion of emerging national and local talent, showcasing new work of artists from Cleveland and beyond. Located in the 78th Street Studios building, Cleveland’s largest fine arts center housing over 30 galleries and artist studios, legation is open by appointment and during building-wide THIRD FRIDAY events. This entry was posted in Art News, cleveland, galleries, ohio, shows and tagged 78th Street, art news, arts, cleveland, exhibit, exhibition, gallery, illustration, legation, ohio, rudolph giuliani, rush limbaugh, sculpture, show, studio, studios, williamsburg brooklyn. Bookmark the permalink.